Improves wet weather visibility through windshield and windows Use on glass and plastic. Heavy rain and wet weather can result in limited visibility through windshields and windows. 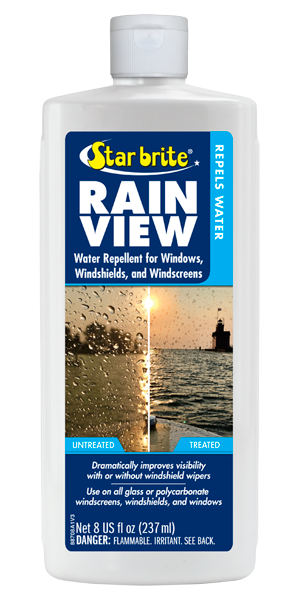 Star brite Rain View is the effective solution to this annoying and potentially dangerous situation. An application of Rain View to glass and plastic (polycarbonate or acrylic) makes the surface so slick that rain and water literally slides off, greatly improving visibility. For use on all automotive and RV windows and windshields, boat windscreens and windows, running lights, headlights. tail lights and any other surfaces where rain can impact visibility. Works with or without windshield wipers. Makes surface so slick that rain and wet weather deposits literally slide off. Clean and dry surface. Pour a small amount of Star brite Rain View onto a clean cloth and apply to surface using firm pressure in an circular overlapping motion. Reapply to cloth as needed to keep it moist. Allow treated area to dry to a light haze before applying a second coating of Rain View to ensure complete coverage. When second application has dried to a haze, wipe treated surface with a cloth lightly moistened with water and then buff treated area with a clean, dry cloth until it is clear and streak-free. One application should last several months. Reapply at first sign of diminished performance.